Depending on whom you ask, motorcycling can be a thrilling, liberating, dangerous or everyday experience. While there is little doubt that motorcycle riding can be a very hazardous sport or hobby, there have been great strides in safety equipment technology in recent years. These innovations are often very affordable, and perform critical roles in keeping motorcyclists safe on the road, and especially in the unfortunate event of an accident. In any industry, technological evolutions can change everything; how a product is used, a product’s price and worth, and how effectively a good serves its purpose. This, of course, still applies to products as seemingly simple as motorcycle helmets, which have developed over time with the creative and revolutionary technologies that motorcycle gear manufacturers have adopted. Wearing a motorbike helmet decreases the chance of a motorcycle accident taking a fatal turn by over 35%; if that’s not motivation enough for riders to invest in a sturdy, reliable safety helmet, perhaps those riders should consider the additional benefits of modern motorcycle helmets, which offer additional benefits beyond saving lives (as if that wasn’t enough) and mitigating motorcycle accident injuries. Motorcycle helmet manufacturers have begun to use airbag technologies with their helmet designs, creating helmets that offer neck and spinal protection immediately in the event of an accident. Sensors built in to these innovative helmets can detect rider speeds and react instantaneously when a crash situation is sensed, filling attached air pockets accordingly to counter imminent impacts. Another high-tech motorbike helmet option is the ThermaHelm, developed in 2008 to counter brain swelling and traumatic injuries in the event of a motorcycle accident. Reacting suddenly upon impact, ThermaHelm helmets kick-in with immediate cooling action, which controls brain swelling and neurological damage common with motorcycle accidents, during the “golden hour” between an accident and arrival at a hospital. An additional benefit of modern helmet designs, many can now come customized with Bluetooth, wireless capabilities, and built-in GPS functionality. There are also DIY kits available for attaching LED brake lights to the rear panels of motorcycle helmets, which can make the roads significantly safer for other drivers and yourself. In addition to modern, improved motorcycle helmets are innovative airbag jackets and vests, which save lives by quickly expanding with air in the seconds prior to an accident. Originally patented in Hungary in 1976, today’s generic airbag jackets operate with C02 canisters built-in to the jackets, which are punctured and fill air chambers rapidly when the jackets are disconnected from motorbikes via lanyard. Within a quarter of a second of disconnection, the jacket air pockets fill up with air, reducing rider impact speeds and force up to 64%; a significant reduction, which can make all the difference in saving a rider’s life. These airbag vests and jackets are effective particularly because of the energy transfers they are able to slow down. Italian motorcycle gear manufacturer Dianese reported an over 90% decrease in transferred energy for crash instances with an airbag jacket present when compared to those without. While these solutions are complex, sometimes-expensive pieces of safety equipment, their lifesaving potential is always worth the investment. Some contemporary models can be bought online for under $500; a price tag easily worth your life in the unfortunate event of a motorcycle accident on the road. Many of these airbag jacket models also feature pockets and back padding space for back protectors, which exponentially increase these jackets’ safety capabilities. Moving beyond airbag and accident-related advancements, today’s high-tech global positioning technologies have vastly increased rider safety in virtually all conditions. Plainly, cell phones and smartphones can do much, but not everything. Suppose you’re on a motorcycle trip cross-country, and your tires gives way. With no cell phone service, how can you call for help? Satellite tracking devices, such as Spot Satellite Messengers, have made it possible for motorcyclists to message for help outside of cell phone ranges via satellite. These devices, and others like them, essentially turn cell phones into a satellite communication tool, allowing stranded motorcyclists and other outdoors enthusiasts to send for help no matter how remote they find themselves, or how dire their situation. Innovative tracking devices also exist to protect your motorcycle in the event of a theft. These devices, often attached in a small, hidden area on a motorcycle frame, can be traced and followed with satellite positioning. Standard GPS tracking devices can be controlled and monitored via the web, and are resistant to heat, moisture, shock and vibration. 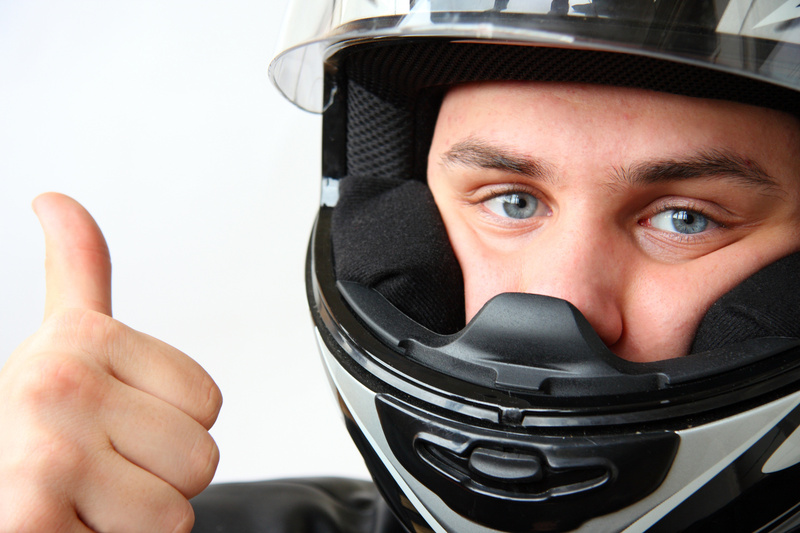 Similar to the technologically advanced helmets we’ve previously detailed in this blog, sometimes improvements on existing motorcycle safety gear can be the difference between fatal and non-fatal motorcycle accidents. Even standard, leather motorcycle jackets can now come equipped with armor plating attachments and breathing mesh materials for hotter riding days, such as those we often see here in Spring Hill. Even motorcyclist boots and gloves have seen advancements beyond what we consider typical, improving performance and rider safety. Thicker boot soles can mitigate the problems associated with high seat cushions, while waterproof lining and advanced grips all but eliminate dangerous slipping. Some motorcyclist gloves even come equipped with titanium knuckle guards for accidents and skidding. Even regular biker clothing, such as standard jeans, can come equipped with Kevlar protection layers. While all of these advancements and new technologies perform wonders in protecting motorcyclists worldwide, they’re not without their flaws or weaknesses. Motorcycling is inherently dangerous, especially here in Spring Hill, where traffic and road conditions are a common hazard for motorcyclists. In the even of a motorcycle accident, we strongly recommend contacting a personal injury lawyer right away, not matter the severity of the crash or your injuries. You can never be too safe following an accident. If you’ve been in a motorcycle accident, or would like to learn more about protecting yourself while on a bike, contact the legal professionals and Lowman Law Firm today. We have extensive experiences with motorcycle cases similar to yours, and can help you get the representation you need following an accident.